Considering all the bloatware and gimmicky applications smartphones have been getting lately, it's like a breath of fresh air to see a near-stock Android phone appearing on the scene. If you're tired of all the unnecessary apps and overpriced gizmos, then maybe the new Moto X is just for you. Google have decided to approach the project in a different way and for the most part I think it will apply to the needs of the every man who doesn't care about specifications and superficial apps and wants a phone that just works. There is a lot of pressure on Motorola to execute this properly after they were acquired by Google for $12.5 billion a year ago. Will they be up to the challenge? Let's find out. Now, I did say the phone targets the more casual consumer who doesn't care much about specs, so let's get this out of the way. The phone doesn't pack revolutionary hardware that will blow the competition away. Its 4.7” display is a pretty standard size. The resolution runs at 720p, however, which to most people seems pretty low and the makers of the phone are criticized for their choice. A plus is the fact that the phone is smaller when compared to other 4.7”display phones – it's like the display was “compressed” to fit a smaller device which I find absolutely adroit – I hate it when a smartphones feels like holding a brick. Speaking of feel, the phone's elegant design and rubberish back make it easy to handle (even with one hand) and you don't have the feeling like you will drop the phone at any given moment. The Moto X is “packing” a dual-core 1.7 GHz Snapdragon S4 Pro processor, a quad-core Adreno 320 GPU and 2GBs of RAM, which is another point of criticism for the new device. Also, it comes with 16 GBs of memory storage space with up to 50 GBs of Google cloud storage. It has a 10 MP rear and a 2 MP front camera. Although the specs are lower than those of most smartphones on the market today, this is not really what Motorola are focusing on. The merits of the Moto X lie in its easy to use interface and near-stock Android 4.2.2 Jelly Bean. The lack of bloatware is really refreshing, especially for people who don't like applications being superimposed on them. This isn't the only thing that makes this phone stand out on the market, however. Its most signature feature is its “always on” mode, which basically means that the phone is always listening to you and is ready to respond to your voice commands. Oh, didn't I mention? Must've slipped my mind – the Moto X is running a more beefy and powerful voice assistant than iPhone's Siri. It only waits for you to use the trigger words “OK Google Now”. Don't worry, the phone is taught to recognize your voice so when somebody else uses the magical incantations, it will not obey their commands. The phone recognizes you as its only master. It will be interesting to see in the following months as the phone gains popularity how people are sitting in coffee shops, talking to their phones. The software the phone uses has the same basic principles as those of Google Glass. You can more or less run your phone without touching the display. The voice recognition software can provide you with almost anything you need. This is where the part with the specs comes out again. You see, even though the phone uses a dual core as its main processor, it's not really using only one processing unit. This is Moto X's X8 set of chips system. There is a special low-powered processor dedicated to the voice recognition and another one for motion monitoring. Both designs target maximum efficiency and energy-saving. I've mentioned the motion sensor. This is connected to the phone's advanced camera control. You have to twist your wrist a little in order to get the camera working and you can take photos by taping anywhere on the display. It takes a little getting used to but when you do, it's pretty comfortable. This is where the easy handling of the phone really comes in handy. Although, again, I think it would be really interesting to see groups of people shaking and twisting their wrists in order to start taking photos. The notification system of the phone is pretty slick, as well. It “pulses” every few seconds, giving you the time and any missed called or messages you might have. 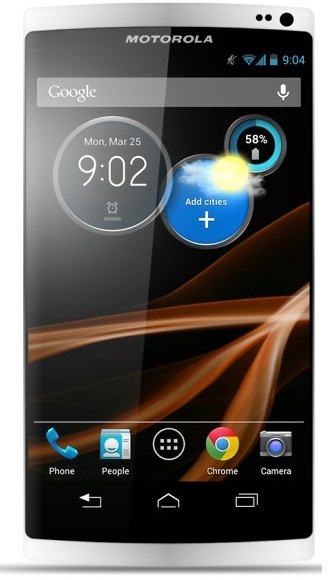 All of this is to say that the Motorola X is a good phone. It doesn't shine with powerful hardware but it works really well and it's a simple and comfortable phone to use. It does great what it was designed for, mainly – providing the user with working phone without tons of bloatware and gimmicks. The voice assistant app is great and it really gives you glimpse of what the future might be like. With only a few voice commands you can get the weather, the time, closest gas stations and tons of other information. The phone uses hardware in new ways and has innovative architectures which causes most people who like comparing specifications to criticize Motorola for their decisions. However, if you don't care much about numbers and want a phone that works well, then this is the phone for you. Moto X is what makes a smartphone really feel “smart”. It comes for $199 with a two-year service contract. Rose Finchley is really passionate about technology and new gadgets. Her job is related to currency trading with PayPal and that is why she loves to read and write for technology and innovations. In her spare time loves to take long walks.